After a precociously talented First Symphony – Shostakovich was just 19 – he penned two patriotic crowd-pleasers before embarking on a formative Fourth. The latter is a key work, as it’s the seed-bed for much of the music that germinates and takes hold in Shostakovich’s later symphonies. Moreover, it was being completed just when Pravda launched that infamous attack on his opera, Lady Macbeth of the Mtsensk District. Despite this savaging, which signalled a major shift in the cultural climate of Soviet Russia, Shostakovich completed the Fourth Symphony, only to withdraw it before the scheduled premiere in December 1936. Kiril Kondrashin and the Moscow Philharmonic gave the first performance of the Fourth in 1961; indeed, this conductor’s complete Shostakovich cycle for Melodiya (MEL CD 10 01065) has become something of a benchmark for these works. For comparative purposes I have selected his performance of the Fourth, recorded in 1966, a 1985 Czech Radio broadcast from Gennady Rozhdestvensky and the USSR Ministry of Culture band (Praga PR 7250 090) and Neeme Järvi’s RSNO account on Chandos CHAN 8640. There are others including a Dresden one from Kondrashin on Profil. but this trio is typical of the trenchant, uncompromising ‘Shostakovich sound’ to which we have become accustomed. Enter British conductor Mark Wigglesworth and his Dutch band, who are recording a Shostakovich cycle for BIS. Not too long ago I listened to their version of the Thirteenth (BIS SACD 1543) and I have to say I was sorely disappointed. Anyone who has heard Kondrashin or Haitink in this monumental, crushing work will surely find Wigglesworth’s cooler, more detached reading somewhat underwhelming. That was my initial response – more on that later – so I was a little apprehensive about reviewing this new Fourth. 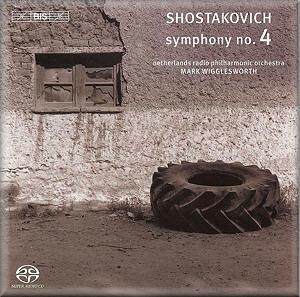 It’s a strange work and, to my ears at least, it’s the one where Shostakovich finally hits his symphonic stride. Structurally it’s quite a challenge, with two potentially unwieldy half-hour movements dwarfing a short middle one. From the outset it’s clear Wigglesworth’s is going to be a more measured reading than most. That said, his is by far the best recording here, warm, spacious and incredibly detailed. By contrast Kondrashin and Rozhdestvensky are pretty ropy, the latter let down by a woolly sounding bass drum and scrawny playing. Despite these sonic shortcomings the Russian orchestras have that rough, sometimes downright uncouth, sound that gives these symphonies their edge or ‘tang’. Surely the Dutch band is much too cultured and polite for this music? The tension and turmoil that lurk behind the notes is particularly well conveyed in Järvi’s reading, aided and abetted by a typically wide-ranging Chandos recording that copes easily with the symphony’s sudden mood-swings. I couldn’t help feeling that not enough of that bipolarity comes through in Wigglesworth’s account of the first movement, although the opening shrieks and the timp crescendi at 21:25 do add some much-needed menace to the mix. To be fair, Kondrashin and Rozhdestvensky aren’t at their most cohesive in this movement, and at least Wigglesworth makes it all hang together tolerably well. To my mind, Järvi strikes the best balance between structure and content here, the two Russians less successful in this regard. Make no mistake, though, Wigglesworth has clearly thought this through, and even if one equivocates about the end result there’s no denying the cool logic and clarity of his conception. The same applies to the Mahlerian central movement, Moderato con moto, which Kondrashin and Järvi shape most convincingly. True, there is plenty of point and elegance to the Dutch band’s playing, but the music’s more fanciful elements are underplayed. That said, the BIS recording is amazingly lucid at this point, picking up every nuance and colour. Indeed, both the CD and SACD layers sound first-rate. Not surprisingly, the gentle figure that ushers in the final movement sounds as atmospheric as one could hope for. The first big peroration comes off exceptionally well – wonderfully crisp and articulate – and even if Kondrashin and Järvi are less tidy they are more extrovert at this point. Curiously, Kondrashin’s reading seems quite swift, whereas Wigglesworth’s scrupulous attention to detail is inclined to make his version feel lengthier than it actually is. For the record, comparative timings of all four recordings are pretty much the same, which just goes to show how misleading such comparisons can be. Wigglesworth’s focus and discipline certainly pay off in the climaxes of the final movement, but again it’s Järvi who conveys the unruly elements of this music most tellingly. For sheer beauty of sound, though, Wigglesworth wins hands down; the ghostlier interludes are just superb, the harps magical. Particularly delightful are those Wunderhorn-like tunes, which make me long to hear Wigglesworth in Mahler. And if you think he can’t be visceral just sample the big tune that thunders in at 19:54. Indeed, this performance is a slow burner, the flame growing ever higher until the final conflagration. As for that spooky finale, it’s seldom seemed so equivocal, the celesta sounding especially eerie over the barely audible beat of the timps. I started this review with some misgivings but I have to end it by saying this is a very persuasive performance of a notoriously difficult symphony. True, it’s not as wild and dishevelled as some, nor is it as propulsive, but it’s no less arresting for that. Wigglesworth doesn’t displace Järvi as my preferred recording of this work, but it has made me want to revisit – and re-appraise – his version of the Thirteenth. Kondrashin remains very special, not least because of his direct link to the composer, but perhaps the time has come to re-evaluate these symphonies. Not only the way they are played, but also the way we listen to them. If that’s the case, then Wigglesworth’s Shostakovich could be the new benchmark for these works.